Mia Shepard joins us from Maupin, Oregon, home to the beautiful and powerful Deschutes River. She and her husband Marty started Little Creek Outfitters in 2003, a fly fishing guide service offering steelhead trips on the John Day, Deschutes and Sandy Rivers. Marty introduced her to spey casting in 2001 and she has been obsessed with swinging flies ever since. This has led her down a path of sleeping in garages and wearing musty waders while working to conserve the river she loves. She is also the Oregon Field Representative for the Theodore Roosevelt Conservation Partnership and a two-time national distance casting champion. 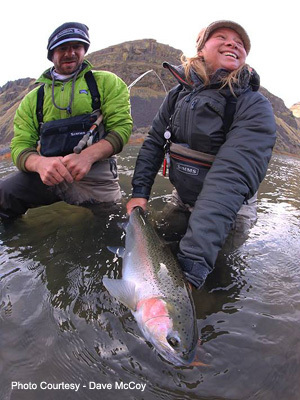 Andrew and Mia will teach the basic principles of spey casting and swinging flies with a two-handed rod. Learn about the proper hold, lift, sweep and forward cast to execute a switch cast, circle spey, snap T and double spey. This class will start with a review of equipment, terminology and casting mechanics. We will help you establish a good foundation through demonstrations and hands-on practice. Put your new skills to the test by swinging flies for brown and rainbow trout on the Delaware River system. When: Friday June 26th, 2015 from 9am - 3pm. Where: www.TightLinesNorth.com (the class will be held where water conditions are best) Tight Lines North will be our base. Lodging on Friday night is available for $30 per person for those who would like to stay for the weekend and fish or who would like to continue the drive to www.SpeyNation.com on Saturday June 27th, 2015 in Pulaski, NY. Gear: Wading gear, spey rod/reel (if you have one – we can supply at no cost), soft hackle patterns, isonychia nymphs and small to medium size woolly buggers in olive, 9 foot leaders in 2-5x and tippet from 2-6x, light sinking polyleaders, etc. Spey gear will be available for those who don’t have equipment. If bringing your own gear Spey and Fishing Gear (We can supply rods and reels for those who don’t have) 4, 5, 6 wt double handed rod or switch rod Matching reel Scandi line that fits the weight of the rod. Contact the shop at 973 244 5990 for help.  9 foot leaders in 2-4x and tippet material in 2-6x Personal Gear (We will not be supplying any of the following gear) Waders and boots with felt or rubber with cleats Wading Jacket Warm under layers (wool, fleece) Polarized sunglasses & retainer Please fill free to call us if you have questions about gear.